Pick up the bucket, spray, and torch stick. Drag the torch stick to a lit torch to light it. 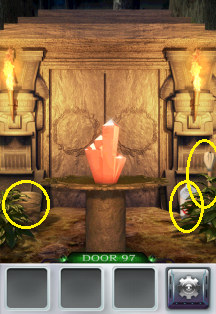 Tap the crystal to find bugs everywhere. Drag the bug spray to kill the bugs. Tap the crystal again to see a net. Use the torch on it. Use the bucket to remove the fire around it. 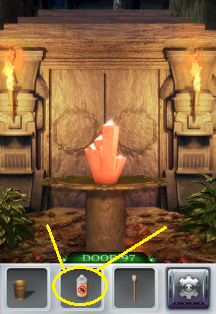 Tap the crystal one last time to get it and open the door.